Announcing the third edition of the mother of all kids’ joke books—and that’s no joke. Now Jokelopedia is even better, with 300 all-new jokes and 11 new spotlights on the comedians kids love today. 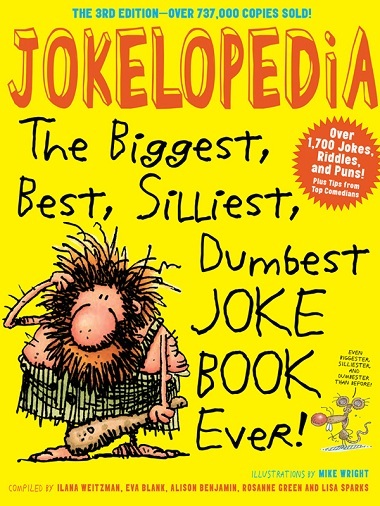 Jokelopedia, Third Edition, is an all-encompassing, gut-busting collection of more than 1,700 kid-friendly jokes, tongue twisters, riddles, and puns. The perfect gift for incurable jokesters, class clowns, comedians-to-be, and aspiring ventriloquists—not to mention the quieter kids who still love a good laugh—it features doctor jokes, robber jokes, teacher jokes, why-did-the-chicken-cross-the-road jokes, lightbulb jokes, movie star jokes, gross-out jokes, vampire jokes, and elephant jokes. Plus, it has the classics, fresh variations on the classics, and jokes with nothing classic about them. And all jokes are organized into categories for easy reference.